The second year Graphic Design and Communications students of Sean Thorenson’s Introduction to Multimedia class compiled the visual motion for the popular Christmas tune “The Twelve Days of Christmas”. This project was used as part of a final class assessment using Adobe Flash. Every student randomly picked their verse and were given parameters to demonstrate their skills in a creative and engaging way. 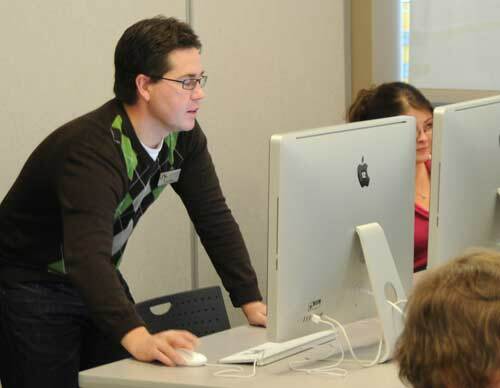 Because of the number of students, two videos were produced (with a contribution by instructor Tom Marple) and coding assistance from Lance Geving. Click the links below to view the movies. 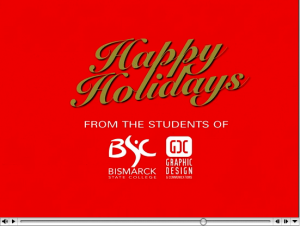 Happy Holidays on behalf of all the students and faculty of the Graphic Design and Communications Department! Zach Allen volunteered his time to help students Friday morning. Ashley Maw, a GDC sophomore student, gets help from Lance Geving. As the semester winds down Graphic Design and Communications students are working hard to complete major projects. One of the sophomore projects is to create a Flash-based Web site for their Intro to Multimedia class. Each year this project generates a heavy load of student questions. The questions are great – they show that the students are working and trying to understand the content. The instructor, Sean Thorenson, gets to every student, but they have to be patient. The questions usually require more than a yes or no answer. Zach Allen, Project Manager, and Lance Graphic Designer and Developer both work in the National Energy Center of Excellence, and both of their jobs require an extensive knowledge of Flash. When Allen and Geving found out that Graphic Design students had questions and they could help, they traded a couple hours of their normal work day to help out. Allen and Geving worked along side Thorenson answering student questions and allowing students to make progress. 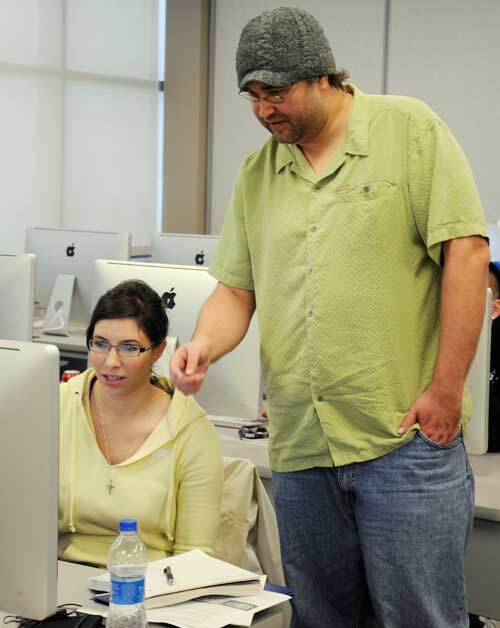 Students appreciated the immediate help as well as the Graphic Design instructors – this collaborative effort helped students and eased the burden on an instructor.